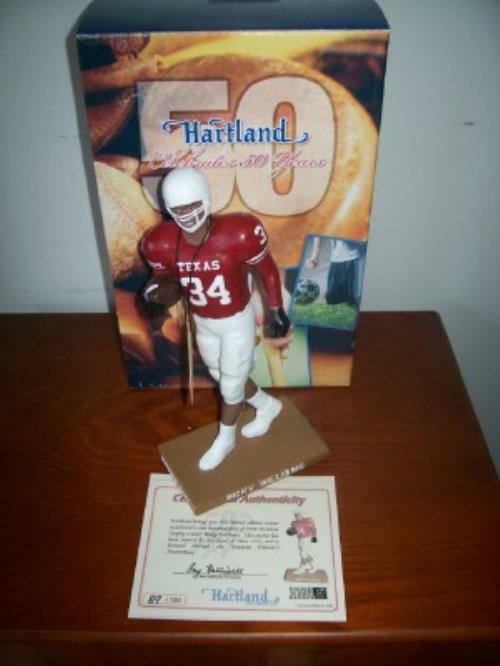 Ricky Williams Texas Hartland Statue! Limited and Numbered to 150, This Figure Commemorates Williams' 1998 Heisman! The Hartland legacy is one of the oldest in the hobby! Originally sold at stadiums in the early 1960s, the original statues sold for just a few dollars each. Hartlands are the first statues ever made in the figurine market! With a lasting legacy of over 40 years, Hartland continues to make some of the finest figurines in the market today! This Williams is part of the Hartland Heisman Series and limited and numbered to only 150! Hartland does very small editions which adds to their value. It comes with original box and certificate! The original price was over $30! Don't delay!